A friend of mine is a big dog (smooth terrier) lover and aficionado. She invited me to a Dog Show in Long Beach. I am always for visiting harbors and I figured I could paint the Queen Mary or the beautiful forest of cranes and harbor machinery. 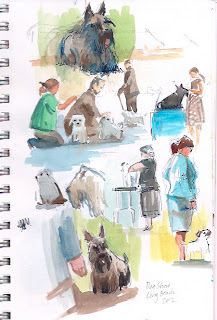 Once I got there I was immediately drawn to the quirky ambiance and specially to the dogs. 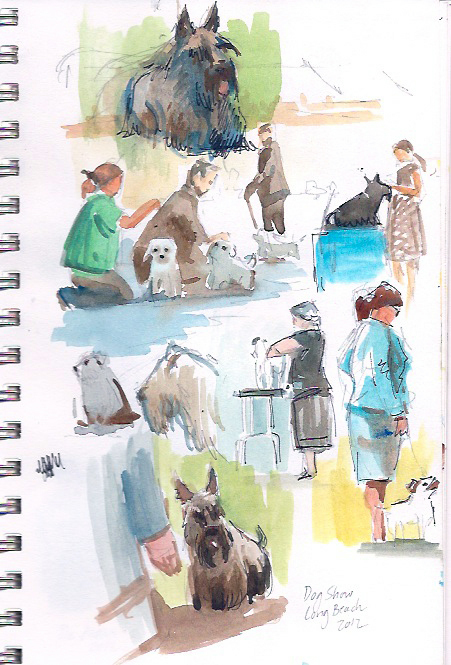 So with the Queen Mary behind me looking massive but uninteresting I set up to sketch the dog show instead. 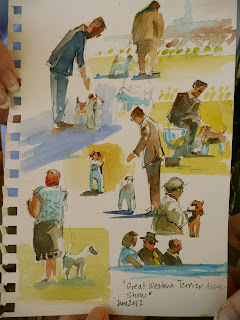 Here are my sketches of the "Wire Terrier" breed segment. A lady bought the sketch off my notebook for 30$. (hey, parking and a new notebook right?). I think it was the most succesful page and it garnered me the most comments and "likes" on facebook I've ever had . Who knew? So I continued sketching away and making lots of new friends in the process. 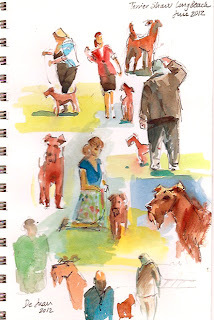 I sketched the irish terriers (along with their handlers and judges). I also jumped around and trying to capture gesture and shape with a maximum economy of gesture and trying to make the pages look interesting by themselves. No lack of models for sure. A especial page dedicated to my friend Mary Lynn and her dogs Mimi and Cracker. I gave the page to her even though I don't like tearing them. After all, she made the invitation and I am glad I shwed up. Sometimes immersing oneself in an environment one knows nothing about (race horses, the military, factories ..I can think of a million) is a great source of inspiration. 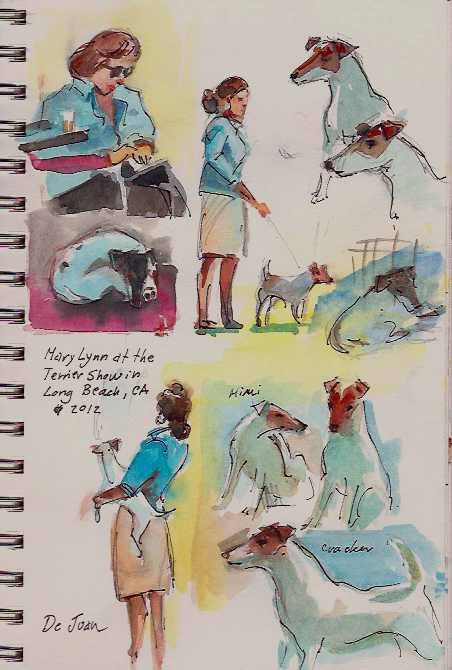 Mary Lynn and her smooth terriers and friend. Nice sketches! Do you always carry a little watercolor set with you, for creative moments like these?